- Complete remote server management with IPMI 2.0-compliant ASMB8-iKVM module and ASWM Enterprise. 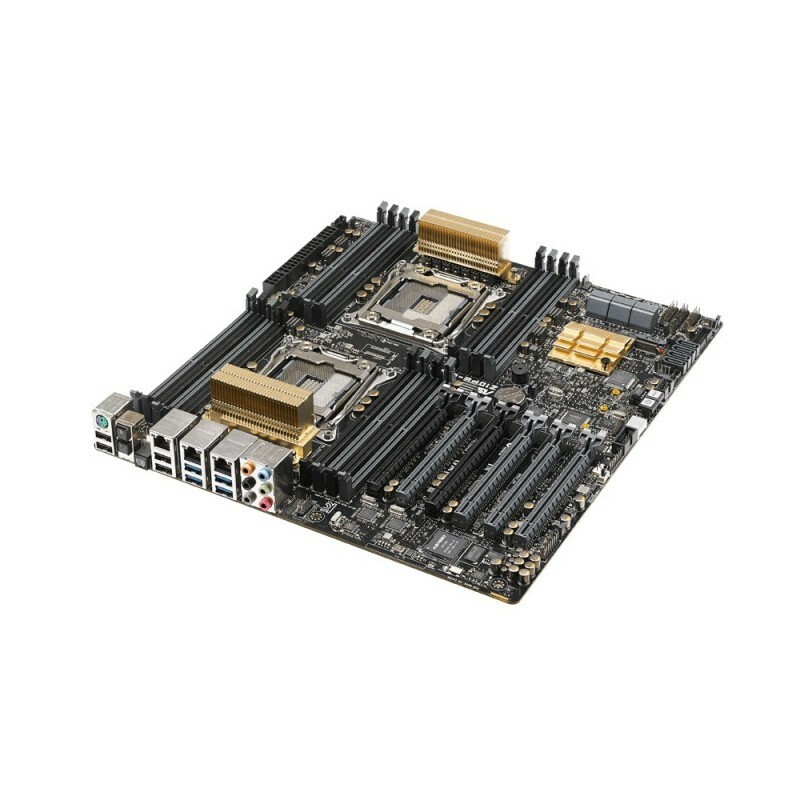 Z10PE-D16 WS packs advanced features onto a standard Enterprise Electronics Bay (EEB) to deliver superior flexibility and performance with dual Intel® Xeon® E5-2600 v3 socket, 16 DDR4 DIMM slots, and six PCI Express 3.0 x16 slots. Furthermore, Z10PE-D16 WS’s layout is designed for optimal airflow, with both the processor and memory slots placed in a parallel arrangement directly behind the fan inlet to promote maximum cooling for increased efficiency — making this motherboard ideal for both datacenter and workstation use. Six PCI-E Gen3 x16 Slots gives you the sufficient I/O interfaces to fulfill your demand for graphic or computing solution. You’ll be able to run both multi-GPU setups. The board features SLI on demand technology, not only supporting up to three graphics cards in a 3-Way SLI but also supporting up to Quad GPU CrossfireX™ technology. The IPMI 2.0-compliant ASMB8-iKVM module enables remote BIOS updates, standalone KVM/Java utility, video recording and BSOD capture. With out-of-band management ASMB8-iKVM provides round-the-clock remote monitoring and diagnosis even if the server operating system is down or offline, and all through a user-friendly web-based graphical interface that works with all major browsers. In addition, ASWM Enterprise software provides one-to-multiple centralized management including BIOS flash, software dispatch, task scheduler, remote control and power control, via colorful and informative graphical interface. ASUS Z10PE-D16 WS couples innovative thinking with premium components to deliver industry-leading power efficiency. Carefully engineered with Beat Thermal Chokes II made of highly conductive and efficient design for minimal-loss power delivery and integrated Dr. MOS MOSFET that both saves space and reduces operating temperatures. For the latest workstation motherboard, ASUS introduce the industry's most durable 12K solid capacitors, and exclusive ASUS ProCool power connectors. Z10PE-D16 WS is built to stay cool under pressure — and boosts performance, power efficiency and product longevity into extreme levels! Z10PE-D16 WS breaks performance barriers by giving you the capability to overclock dual CPUs. Ai Overclock Tuner and Xeon Turbo Charger in the BIOS are dedicated to boosting the CPU’s overclocking performance by up to 10% to reach incredible CPU High Performance Linpack (HPL) scores and improves SPEC CPU™ 2006 benchmark results by up to 6.87%. As the Z10PE-D16 WS is meant for professional users who rely on non-stop operation, stable power delivery is critical. Real time power supply health detection helps prevent sudden system shutdown and provides hassle-free notifications should power delivery be insufficient. Additionally, LED messages on the board clearly indicate any relevant power issues in the event your system fails to boot. USB Charger+ charges USB devices up to three times (3X) faster than traditional USB sockets. Use it to juice up your smart devices even when the PC is asleep, hibernating or powered off — a brilliant convenience! The motherboard supports the latest Intel® Xeon® processor E5-2600 v3 product family with dual LGA 2011-3 sockets. Memory and PCI Express controllers are integrated alongside quad-channel 16-DIMM DDR4 memory and 80 PCI Express 3.0 lanes. This provides great graphics performance with superior energy efficiency. The Intel® C612 Chipset is the latest single-chipset design that supports Intel® Xeon® processor E5-2600 v3 product family for dual LGA 2011-3 sockets. It improves performance by utilizing serial point-to-point links, allowing for increased bandwidth and stability. Additionally, the C612 comes with 10 x SATA 6Gbit/s ports for faster data retrieval, doubling the bandwidth of current bus systems. Both SLI™ and CrossfireX™ architectures work flawlessly on the new Z10PE-D16 WS motherboard, with PCI Express slots designed to accommodate the power of multi graphics cards. Whether for professional graphics work, heavy duty multimedia or dedicated gaming, more than ample graphics power can be applied whenever needed.